Washington, D.C. (July 25, 2016) — According to a paper published today in Nature Genetics, researchers part of Project MinE’s global gene sequencing effort, funded by The ALS Association through ALS Ice Bucket Challenge donations, have identified a new ALS gene, NEK1, which now ranks among the most common genes that contribute to the disease, providing scientists with another potential target for therapy development. This was the largest-ever study of familial (inherited) ALS, involved contributions from over 80 researchers in 11 countries, and was led by John Landers, Ph.D., of University of Massachusetts Medical School in Worcester, Mass. and Jan Veldink, Ph.D., of University Medical Center Utrecht, in The Netherlands. ALS is a progressive neurodegenerative disease that affects nerve cells in the brain and the spinal cord. Eventually, people with ALS lose the ability to initiate and control muscle movement, which leads to total paralysis and death, usually within two to five years of diagnosis. While 10 percent of ALS is familial, meaning it’s genetic, the other 90 percent of ALS cases are considered sporadic, or without a family history. However, it’s very likely that genetics contribute, directly or indirectly, to a much larger percentage of ALS cases. The ALS Association announced funding for Project MinE, an international effort to sequence the genomes of at least 15,000 people with ALS, in October 2014, which established the U.S. arm of the initiative with Dr. Landers’ research efforts. Project MinE was the brainchild of entrepreneur, and person living with ALS, Bernard Muller, who, along with another patient, Robbert Jan Stuit, saw an opportunity to expedite genetic understanding of the disease after a tour of a Research ALS Center in the Netherlands where thousands of DNA samples were stored and not being used because it was too expensive to do the research the Center wanted to do. According to Muller, “The ALS Ice Bucket Challenge enabled us to secure funding from new sources in new parts of the world. Thankfully, The ALS Association brought Project MinE to the United States. This transatlantic collaboration supports our global gene hunt to identify the genetic drivers of ALS. I’m incredibly pleased with the discovery of the NEK1 gene adding another step towards our ultimate goal, eradicating this disease from the face of the earth. NEK1 was discovered through a genome-wide search for ALS risk genes in over 1,000 ALS families, and was independently found through different means in an isolated population in The Netherlands. Further analysis in over 13,000 sporadic ALS individuals compared to controls again revealed an overrepresentation of variants in the same gene. The variations discovered in the gene sequence are predicted to lead to gene loss of function. NEK1 is known to have multiple roles in neurons, including maintenance of the cytoskeleton that gives the neuron its shape and promotes transport within the neuron. In addition, NEK1 has roles in regulating the membrane of the mitochondrion, which supplies energy to neurons and in repairing DNA. Disruption of each of these cellular functions through other means has been linked to increased risk of ALS. Understanding NEK1’s role in disease will provide an important new target for therapy development. The ALS Associations is currently funding Drs. John Landers and Catherine Lutz, Jackson Laboratories, to develop novel mouse models to better understand the consequences of the loss of the protein’s function for the ALS disease process. They will provide rapid access to these models for the broader ALS research community as soon as they are generated. These tools are important for ALS drug development. Funding for Project MinE also came through The ALS Association Georgia Chapter, The ALS Association Greater New York Chapter and New Amsterdam City Swim. 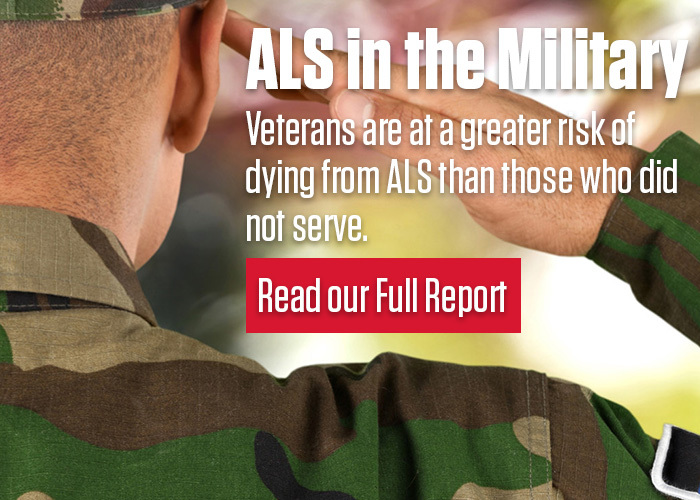 This August, The ALS Association is seeking to raise awareness and funds to finish what the ALS Ice Bucket Challenge started in 2014: an end to ALS. The new campaign, called Every Drop Adds Up, pays homage to the Ice Bucket Challenge, visually emphasizes the now iconic “bucket,” and builds on the idea that when people come together they can make big, impossible things happen. Visit www.everydropaddsup.org to learn more.